Beetroot, although mostly used in savoury cooking, is actually wonderful in sweet treats. It goes beautifully with chocolate and it makes chocolate cakes and other bakes a little lighter and healthier – without compromising the yummy chocolate taste. I grow my own beetroot (they don’t require much effort at all) and I tend to roast them in the oven before using them in my recipes. However, you can also buy ready-cooked beetroot from supermarkets – just make sure you buy the non-vinegar variety! In this recipe I have used 100% plain chocolate, but you can use plain xylitol chocolate, too. If you do, you won’t need quite as much Sweet Freedom/agave nectar. 1. Start by making the pastry: put the flours, xylitol and butter into a mixing bowl and rub them together into a crumble with your fingertips. 2. Add 2 teaspoons of vanilla extract into the crumble and use your fingers to combine it into a ball. If the pastry is too dry and doesn’t stick together, add a little water, ½ teaspoon at a time, until you can form a ball. 3. Take a 22 cm (8 ½ inch) non-stick loose-bottom tart tin/pan and press the pastry to the bottom and sides. Place it in a refrigerator while you heat the oven to 180C/350F/gas mark 4. 4. When the oven is up to temperature, take the tart tin/pan out of the oven and prick the base of the pastry all over with a fork. Place some parchment paper on top of the pastry and fill with ceramic baking beans (you can also use pulses or rice if you don’t have baking beans). 5. Bake the pastry case for 10-15 minutes, until it’s cooked. Please note that gluten-free flour doesn’t brown in the same way as wheat flour, so your pastry will be pale. Remove the baking beans and set the baking tin/pan aside to cool while you prepare the filling. 7. Put the egg yolks, sweetener, corn flour/starch, cocoa powder and vanilla extract into a large jug or bowl and mix them thoroughly. Set them aside for the time being. 8. Put the cream, beetroot and chocolate into a large saucepan and gently heat the mixture, stirring constantly. When the chocolate has melted and the mixture has come to the boil, take the saucepan off the heat and slowly pour the mixture into the jug while whisking all the time. 9. Pour the mixture back into the saucepan (or if you detect any signs of burning on the bottom or the sides of the saucepan, transfer to a fresh saucepan) and gently heat without boiling until the mixture has thickened. This should take 1-2 minutes. If the mixture starts to separate, this means that it has over-heated. You can get it back to a smooth consistency by taking the saucepan off the heat and cooling the mixture by whisking it vigorously until it becomes smooth again. 10. Let the mixture stand for about 10 minutes, then pour it into the tart tin/pan. Let the filling cool to room temperature, then place the tart in a refrigerator for at least 4 hours. 11. Dust the tart with some cocoa powder, loosen it from its tin/pan and cut to slices. Serve on its own or with some vanilla cream or custard. 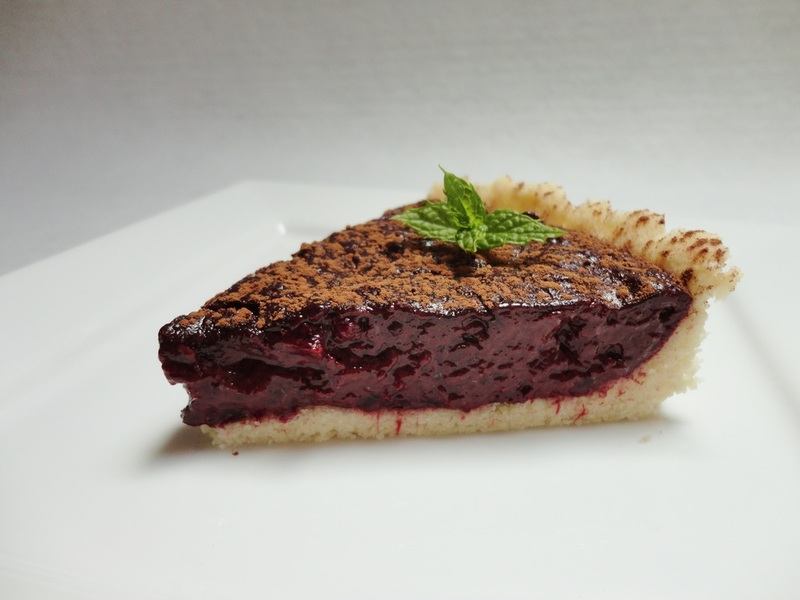 To make this tart lactose-free, use vegetable margarine instead of butter and lactose-free cream instead of ordinary cream.